I always enjoy being invited to write something when bonknhoot makes the podium. However, on this particular occasion my pleasure is much tempered by the events as they transpired, for which I only have myself to blame. Memories of a race from Seattle to Vancouver earlier this year flash back as I write, where SS (skipper stupidity) assisted me in converting a P1 into a P4, but on that occasion there were mitigating circumstances: a series of marish hard-to-read radically shifting WXs. A2 got that P1 that time and more deja vu, in the Bay of Plenty he once again pipped me this time for P2, if only by seconds, which only made it worse. But well done, A2, and rafa too of course, who made the least mistakes of all us. So… seeing I didn’t get to write about “Sleepless in Seattle”, let me now try to captivate you instead with “Asleep off the Mercury Islands”. There are many weaknesses in my SOL armoury, and reaching, hunting for the right trade-off between angle, pressure, VMC and actually getting there, is certainly one of them. There should have been none of that required for Auckland to Tauranga, as an anti-clocking forecast was neatly going to break the race up into a beat to Channel Island and a run down the coast of the Coromandel Peninsula. And I was back home behind a proper PC with a fully functioning version of QtVlm (not the latest, which has a bug, see here). • the long leg in on port will have you easing sails. 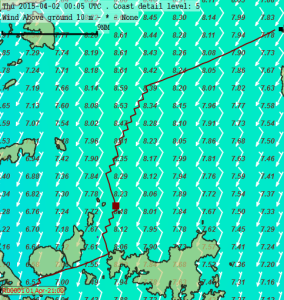 So… even if there wasn’t a BBQ risk to sailing by DCs, if you want to win, you have to sail by hand. And to sail by hand, you have stay awake. I’m sure rafa and A2 did this too, and below is how we tacked our way out into the middle of the Hauraki Gulf (will I ever get to see it in real life?). 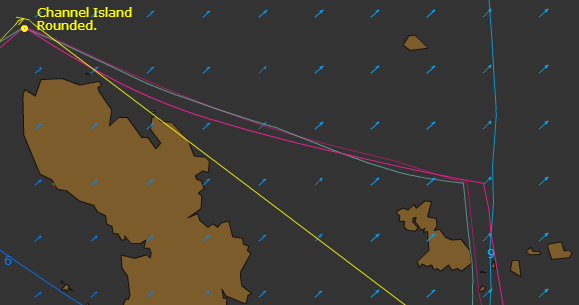 A2’s track is the grey line, furthest inside the bend but hugging the northern shores of the islands trying to stay out of the softer winds further North in the bay; rafa’s track is the lighter pink one, not bothering with a hitch North as proposed by Qt, and bonk’s the bright pink one featuring two hitches North to get as far inside the bend as possible without going the other side of Rangitoto. I felt my two hitches had given me an ever so slight advantage over the rest of the southeners, but if it had, I quickly threw it away by putting in a further two in the lee of Motutapu, out of strongest pressure for no further gain in angle, and out of sync with Qt (but hey, a new WX had come through and I hadn’t tried to run Qt with it again). Back on port, the next thing that happened was my internet connection went AWOL. By the time I had it back, I had sailed further East and was losing pressure again. I tacked and was surprised to see rafa carrying on further. Equally surprising was that A2 and the northerners were looking pretty good. rafa had tacked slightly to weather and slightly astern, and there were plenty of others all in the hunt. Even A2 had tacked earlier than Qt’s original proposal but was clearly too far to weather and astern. 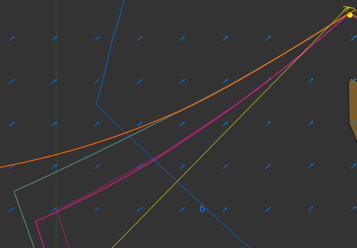 So… I set about sailing the curve by hand, initially taking all the height I could get to shorten the sailing distance (shallower curve) and get closer to the bunch who were generally a little further to weather, and then freeing off by switching back and forth between CC and constant TWA courses to thus avoid all perf loss pennos. I use my own optimum VMG angles rather than WXInspector and always generate a full set of these with Excel for every polar we sail. 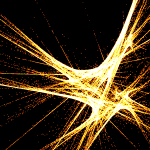 I have a UDF (user defined function) which allows me to interpolate ‘fairly’ (i.e. not approximately on the basis of straight line segments) BS at any intermediate TWS and TWA (in between the data points provided in BrainAid’s ‘detailed data as CSV’ file). Using this I beef out the BrainAid file to BS values per every 0.1 degree change in TWA and 0.1kn change in TWS, and then just apply the cosine rule and Excel’s MAX() and MATCH() functions to determine optimum VMG angles. For the wind speeds we were laying into the Channel Island in, the resultan1t series looks like this. 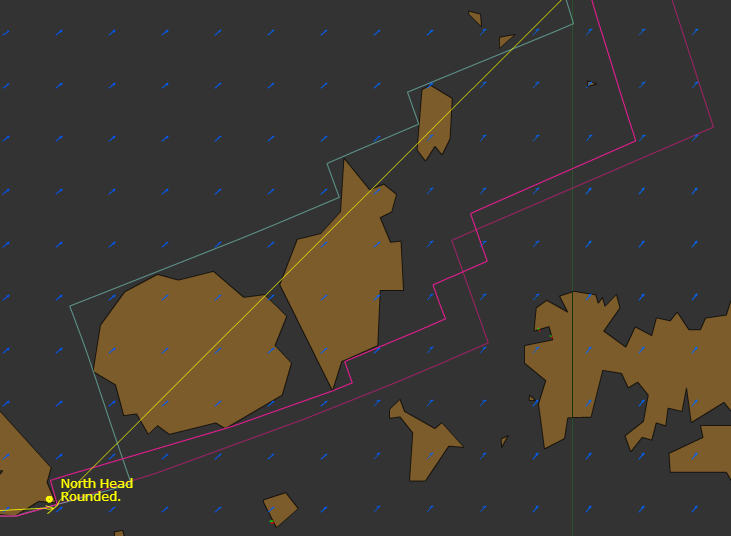 At Channel Island, I had 0.07nm on rafa, there was a new WX and Qt was proposing a curve to take you close to the peninsula but ultimately staying North of the Mercury islands, followed by a gybe for a run turning into a fetch into Tauranga. It was gone 05:30 in the morning and I decided I would test my new ‘uploader’ and get some sleep. The ‘uploader’ is another bit of Excel work and helps me to correct a Qt csv file for differences between its interpolation of the grib data and SOL’s, and also to smoothly interpolate course changes at intervals of 1 minute (if you wish). Having checked the wind via WXInspector, I opted for a little more easting in the CCs (2 to 3 degrees), generated the DC file, uploaded it, set an alarm and went to bed. I didn’t program in the gybe, wish I had! When I awoke it took me a while to get back behind the PC, but when I did I was pleased to see bonk had sailed a very fair curve and was on 144 TWA, slightly hot. However, rafa and A2 had just gybed. I must still have been a bit disoriented and didn’t gybe to follow, but let bonk sail on to free her further to about 148 TWA, the optimum downwind VMG. Bad idea and I didn’t wait too long to gybe onto 148 TWA earlier. Bad idea as well, and I hotted up. Isles and islets, and I hotted up more to cross rafa’s track 0.3nm behind, keeping high; the wind was heading after all and A2 was much further in under the coast. Final bad idea and at the Finish rafa had increased his lead on bonk to 0.5nm and A2 beat bonk by 0.03nm, with Chaos just a few 0.01nm behind again. I took a nap before the start of this race & was able to be awake for the 19hr duration. 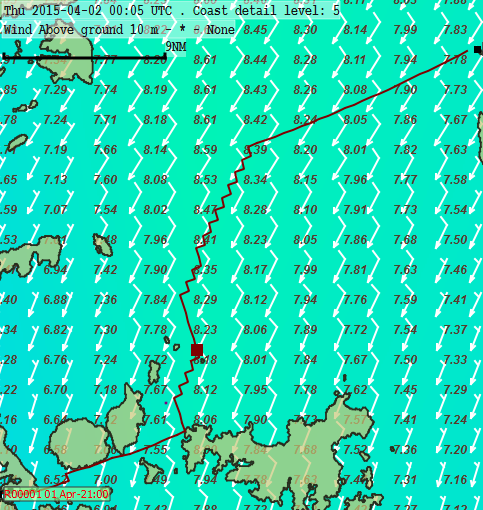 Wind pressure trumped wind angle both on the way to the channel island mark & down the stretch to the finish. I made the wrong choice twice. Attendance was low for this “SYC” event & attrition even worse. Trying to assess the actual position of our 2 boats to the line over several hours was problematic as the sever idiosyncrasies seemed to be playing tricks.